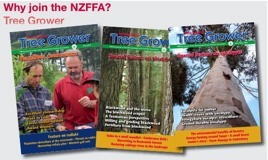 Anders Crofoot, New Zealand Tree Grower August 2012. Trees are a crop, and as with all crops there are a variety of risks. The risks vary not only with the season, but with the age of the crop. Some risks are greater during establishment than later, and others may only come into play at harvest. Still other risks will be present for the entire time the tree is growing. However, trees being a crop with a very long rotation there are a number opportunities to mitigate those risks. Either there is time to correct a problem, or you may decide to delay action until waiting for a more favourable opportunity. When planting there is always a risk that the trees will not establish successfully. This can be mitigated with careful ground preparation and selection of the appropriate species for the site. With a field crop, if it does not establish, the game is over. Unless you are blessed with a very long growing season and have time to re-establish, you usually have to move on to another crop. With the long rotation of trees you have the opportunity to go back and replace the failed young trees for the first few years, so small problems can be tidied up. The downside of a long rotation for a tree crop means that some of the risks are there for a long time and have multiple chances to trip you up. Drought is the greatest risk during establishment for young seedlings. 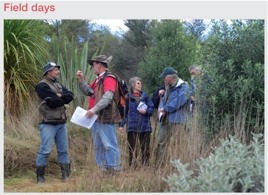 Species selection and location can help, as can site preparation and planting techniques. Once the trees are established, provided they are suited to the average climatic conditions of the site, the risk of loss to drought should drop. New Zealand is situated in the roaring forties so wind is always a risk. During establishment the seedlings can be whipped around breaking rootlets, but appropriate planting techniques can help prevent that. Older trees can be at risk from broken branches or crowns, but appropriate species and site selection as well as good silviculture can help reduce that risk. In extreme events whole trees can be blown down but that is not be a common occurrence. Fire risk will vary depending on the climate and also proximity to people. A dry climate creates a higher risk, but that can be mitigated by minimising the opportunities for ignition sources such as vehicles, people with cigarettes and camp-fires. Power lines and trees do not make a good mix. Planting trees close to power lines may maximise production off the land area, but greatly increases the fire risk. Branches growing into power lines not only cause problems with the quality of power on the line, but the arcing can start fires in dry conditions. In the past 10 years there have been over 280 rural vegetation fires caused by trees on power lines. This is an area that could use some discussion and agreement on national guidelines or regulation. The advent of the Emissions Trading Scheme (ETS) into New Zealand has introduced another risk. For example, if you have trees in the ETS, with a fire there is not only the loss of production and the costs of fighting the fire, but now you will have to surrender carbon credits to cover the trees that were destroyed. This risk can be reduced by having a sufficient supply of carbon credits to surrender, by holding some credits in reserve or being prepared to go out into the market place and purchase replacements. At harvest time you move from natural risks to market risks. Here again the flexibility of time of harvest has an advantage. If the price is not attractive today you can harvest next month or even next year. Contracts for forward supply are also a way of taking out market risk. You will know the price you will receive at harvest. If you have pre-1990 trees, there is the compulsion to re-establish a forest within several years. In addition to the normal establishment risks there is now the added possibility of a substantial fine for lack of performance. For post-1989 trees you will have to surrender credits to cover the carbon assumed to be released at harvest. If you did not sell the carbon credits then they can simply be returned. If you have enough forest and do not cut everything all at once you can hold enough credits to cover your harvest liability at any one time. Alternatively, you can go on to the market and purchase credits to surrender. Currently the government also offers the option to satisfy the liability with a payment of $25 for an NZU rather than the surrender of a unit. In the early months of 2012 the price of an NZU fell to below eight dollars, so that is not a particularly attractive option. However, it does highlight some of the risks around the volatility in pricing of carbon credits. If you could have sold credits on 17 March 2011 for $20.90, and replaced them in mid 2012 at seven dollars or less, you would have been quite pleased. Carbon trading has introduced a new element to forestry, but currently it is very high risk due to the high volatility. Timing and management can mitigate a number of risks, and insurance can also be purchased to cover off some of the risks. This would be covering the costs of fire-fighting, or the value of the trees, or more recently the value of the carbon credits. Every situation will be different. Different areas will have different environmental risks. People’s perception and tolerance for risk also vary greatly. In the end there are a variety of things that can be done to reduce risk and each person should take the steps that suit their situation.